Nomination has selected the most romantic jewellery for you to surprise your better half with as a special gift. Choose between bracelets, necklaces, rings and earrings all Made in Italy and crafted with precious high-quality materials: gold, sterling silver, stainless steel and gemstones make up your anniversary and romantic gifts. 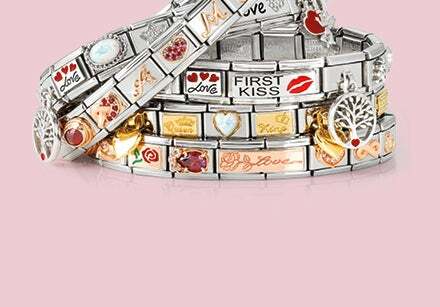 Celebrate your love with a Composable bracelet that’s made just for the man or woman of your dreams: choose the most romantic links and charms and create a customised bracelet which tells your story. Select a romantic ring for her from the Bella Collection: sterling silver and Cubic Zirconia combined in the shape of a heart makes a truly romantic piece of jewellery. For him, choose one of the stainless steel bracelets from the Steelikons Collection: polished or decorated with Cubic Zirconia, these bracelets are always composed of geometric charms. Dedicate all the necklaces from the Angel and Bella collections to her: whether they’re bright pendants or a more minimalist style, they always sparkle. 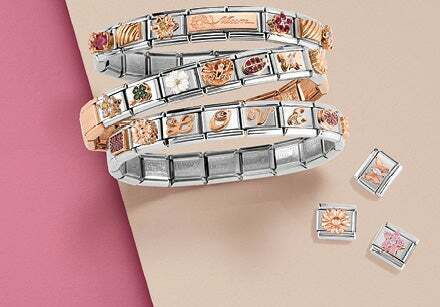 If you’re looking for a delicate and refined woman’s bracelet instead, check out the many options in the Roseblush or Extension lines, which feature yellow and rose gold details. Romantic gifts? Let Nomination help you choose between the most beautiful jewellery dedicated to love!